Mixing red, green and blue equipment in a precision farming system can create a rainbow of headaches, but Jamie Shenk, operations manager at Beauregard Farms, thinks he has found a good pain reliever: an independent precision farming supplier. Beauregard Farms, a 2,000-acre primarily no-till corn and soybean operation near Brandy Station, Va., relies on two John Deere GreenStar systems to control the Kinze 3650 12-row planter, Case IH SPX 3310 sprayer with a 90-foot boom and John Deere 9870 combine with a 12-row head. One system is primarily used with the planter and pull-behind fertilizer spreader. The other is used in the sprayer and the combine. 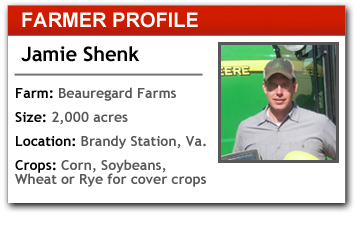 Shenk previously worked at the local John Deere dealership as its Agricultural Management Solutions (AMS) expert, so he is very familiar with the GreenStar equipment that is the basis of his precision farming system. Shenk is frustrated with equipment dealers’ inability to offer cross-brand equipment support. “We have found that independent suppliers are the missing link,” he says. Shenk and his farm manager, Jim Brown, use the Case IH sprayer for herbicide, insecticide, fungicide and nitrogen applications. They wanted to make sure their system could be used across all their equipment, regardless of brand. Their previous pieces of precision farming components were stand-alone units. Shenk looked to Ag Express Electronics in Sulphur Springs, Ind., to get the control harnesses and wiring he needed to get the Case IH sprayer and GS3, ATU, 2630 display and SF3000 receiver to work together. Now, the sprayer has true auto-steering and a five-section control on the 90-foot boom. Although the sprayer is set up with auto-steering, the planter tractor — a John Deere 8320 — is not. But Shenk says this addition is next on the list of technology additions to the farm. However, he recently put Ag Leader SureStop row controls on the planter, which also required help from Ag Express to get the proper harnesses and wiring to work with the GreenStar system.